We were called for a Flying Squirrel Removal in Woodbury, GA. Upon arrival at the home we noted that the home was a log cabin. This is a favorite home construction for flying squirrels. During our inspection we located numerous entry points. The most common entry point for flying squirrels is thru the construction gap. This is the area where the roof decking meets the fascia board. This area is commonly covered by gutters and gutter guards. However many gutter installers are not as focused on keeping animals out as they are on keeping leaves out. Example number one is where the gutter meets at a ninety degree. See below. 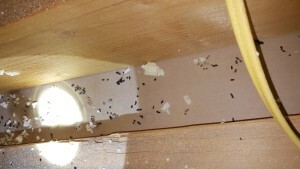 The second most common area we find flying squirrels entering attics is the plastic continuous ventilated ridge. 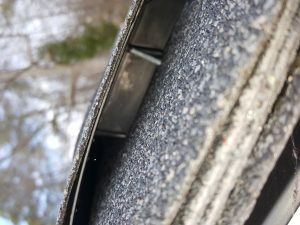 Many Roofing contractors improperly install this type of ridge vent. 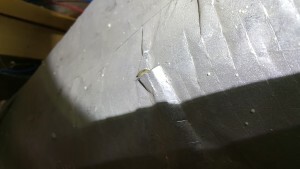 In the picture below you will see that the installer did not rotate the piece of ridge vent after cutting the end to length. This leaves a prime entry point at the peak of the roof where Flying Squirrels like to enter. In the picture below you will see that the end of the ridge vent is wide open to any rodents and squirrels and bats. 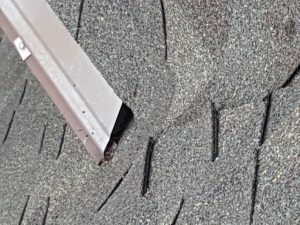 The common repair for this issue is to tear off the bad area and reinstall the ridge vent properly and re install the shingle overs. However this process has recently been replaced by a product called Ridge-Guard. This allows the plastic continuous ridge vent to remain in place and this product seals the weak areas from gnawing animals. See below for this opening. Flying Squirrel Entry under the Ridge vent due to improper install. 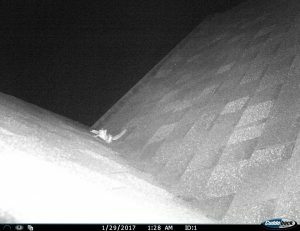 The third most common area that allows Flying Squirrels to enter your home is when gutter guards are not install tight to the roof. As demonstrated below you will see that this area allows Flying squirrels to enter the gutter system and into the constructions gap. We normally remove the gutter guards and seal the construction gap with an exclusion material to prevent entry into the construction gap. 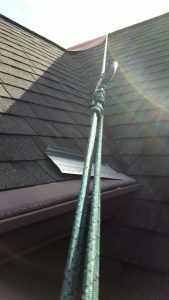 We also repair the open gutter guards to prevent leaves from entering the gutter in these openings. See the opening below. Below is the prime example of Flying Squirrel exiting from under the gutter guards while exiting the attic to go foraging. Flying Squirrel Exiting from under the Gutter Guards. If your having issues with Flying Squirrels at your home my hopes is the above information will assist you in making the decision on the needed repairs. If you would like to speak to us about setting up an inspection to remove your flying squirrels from you home see more information at www.ecowildlifesolutions.com. 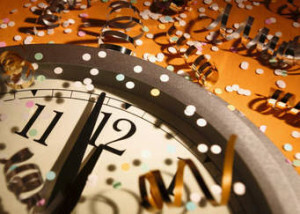 Call (678)340-3269 to schedule an appointment. We were called out to resolve some beaver dam issues in Harrisonville, GA . We found a thriving family of beavers that had built three dams blocking the spillway, and two emergency run around. The beavers has raised the level of the lake by 3 feet above normal levels. After removal of the beavers we began the process of removing the dams in a controlled manner to prevent downstream flooding. This video is the beginning of this process of beaver dam removal to resolve the lake levels. You will see that we don’t cause a mass failure of the dam in the videos. This would cause flash flooding down stream. Instead we utilize a controlled release of the backed up water to prevent down stream issues. If you are having issues with Beavers and would like to discuss Beaver Dam Removal at your property. Call (678)340-3269 to schedule an appointment. Raccoon removal in Turin, Ga after the Silver Queen corn patch was raided. We were called in to remove a raccoon after the Silver Queen Corn field was raided for the last two nights. We were able to remove the first raccoon with a belly full of fresh corn. Our customer stated that he had lost the entire crop of corn. 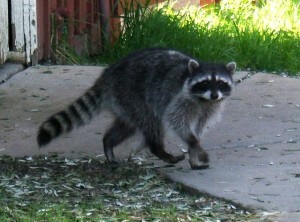 If your crop is almost ready to harvest and the Raccoons have found your crop give us a call at 678-340-3269 or see more at www.ecowildlifesolutions.com. Flying Squirrel Foot Prints in Dust . 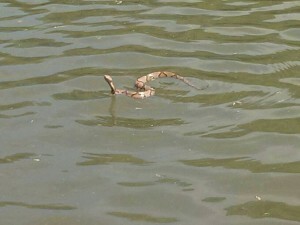 We were called in for a Wildlife Inspection on a home in Newnan, GA. The Homeowner had a inclination that he had flying squirrels after being to by his Pest Control Company. The homeowner did state his activity was heard after dark and ceased during the day. After further inspection of the property we located trails on the HVAC duct work and toilet areas around the attic. 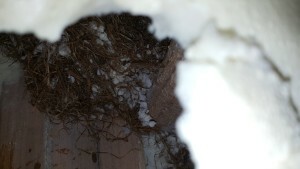 We located a cavity gnawed in the Icynene Insulation and filled with nesting materials. Fortunately the nest did not have any babies as of yet. At this point we moved our inspection to the exterior of the home to locate the entry point into the home. We initially thought that the Flyers were entering thru a vent dampener. 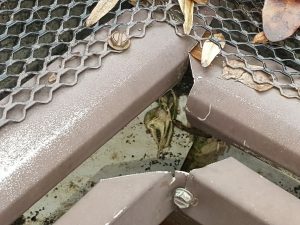 Upon further investigation we found that the Flyers entered by gnawing thru the gutter guard system allowing access into the gutters leading to a construction gap allowing entry into the soffit box. We at Eco Wildlife Solutions would like to share with everyone the 2015 Santa Claus Tracker. To be able to track his course for your kids Click Here. A continuation in our series on Snake Identification of the Snakes of the Southeastern United States. We are providing this series to assist our customers with the ability and tools to assist them in identifying the native snakes of our area. Description: The eastern indigo snake (Drymarchon couperi) is a massive, black snake. It is the longest snake native to the United States, ranging in size from 60-84 inches (152-213 cm), and is entirely shiny bluish-black color, including the belly. The chin and sides of the head are usually colored reddish or orange-brown. Juvenile indigo snakes look very similar to adults but have much more red on their heads. Indigo snakes are sexually dimorphic, with males growing to larger lengths than females. Range and Habitat: Eastern indigo snakes are restricted to Florida and southern areas of Georgia, Alabama, and Mississippi. Although reported historically from extreme southern South Carolina, indigo snakes have not been confirmed in the state in recent years and the early records are questionable. The closely-related Texas indigo snake (Drymarchon corais) is found in southern Texas and other subspecies range into Central and South America. Until relatively recently, all indigo snakes in the U.S. were considered to be the same species, D. corais. 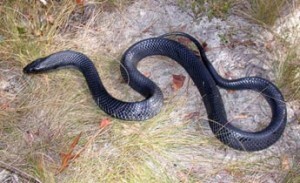 In the Southeast, indigo snakes are restricted to areas of xeric pine-oak sandhills, which are usually inhabited by gopher tortoises. These snakes use gopher tortoise burrows as shelter during the winter and during the warmer months for nesting and refuge from intense summer heat. 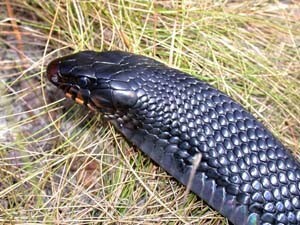 During the active season indigo snakes may move long distances and often forage along wetland margins. Habits: Indigo snakes are active strictly by day. During the summer they prefer wetland edges where prey is abundant but move to drier habitats in the winter. Indigo snakes breed in the winter and are more active in cold weather than most other snakes. When cornered, they may flatten their heads, hiss and vibrate their tails, which produces a rattling sound. Despite these intimidating acts, the indigo snake rarely bites. Indigo snakes regularly feed on mammals, birds, frogs and other snakes, including rattlesnakes and cottonmouths. Also, these snakes will occasionally feed on young gopher tortoises. Conservation Status: The eastern indigo snake is currently listed as a federally threatened species in Georgia and Florida, due primarily to habitat loss. This species is protected throughout its range. Stevenson, Dirk J., Karen J. Dyer, and Beth A. Willis-Stevenson. 2003. Survey and Monitoring of the Eastern Indigo Snake in Georgia. Southeastern Naturalist 2(3):393-408. Bat Removal from home in West Point, GA. This is Guano on one of the Decorative Keystone Lintels. We received a call from a customer in West Point, GA for Bat Removal. It seems that the contractor had a signature upgrade to his homes to jazz up his homes. This feature is the downfall of the design on these home. This builder added a decorative molded keystone and lintel above each window and door. Now all good intentions crumble with poor follow thru. 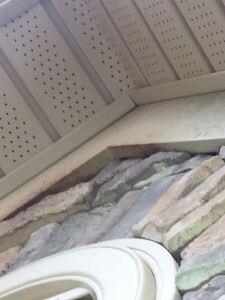 The contractor installed these features with 18 gauge pin nails which led to them falling away from the homes allowing bats to enter behind the voids. 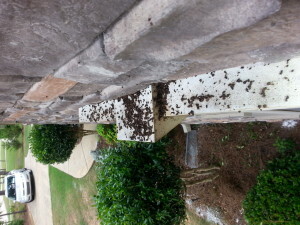 Bat Guano behind decorative feature. We also found the bats utilizing another cavity created by the contractors of this home. When this home was built the trim crew completed the home and the rock mason came second. 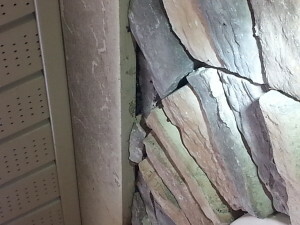 The freeze board in this home does not have rock completely behind it. This defect allows the bats to sneak behind this area and utilize this void. Here the freeze board does not cover the rocks completely. Bats are very opportunistic with their roosting areas here we removed a bat from each open area due to the rocks being square and the freeze board running at an angle. You can see the sebum on the freeze board from the bats rubbing as they entered the voids. We offer trapping to catch or remove ALL Nuisance Wildlife. We were called out to a Yellow Jacket Removal from a home in Moreland, GA today. We were task with extracting the yellow jackets from a bay window before a child’s birthday party. We were able to locate the nest and extract the nest whole chemical free and save the day. 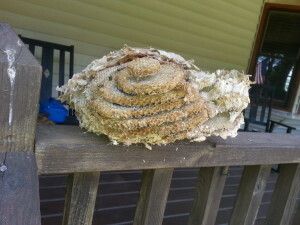 This is the protective layer around a yellow jackets nest. Yellow Jackets are very aggressive species of wasp that normally are ground dwellers building a paper nest underground, however if given the opportunity and suitable cavity inside a structure that is both protected from temperature and weather they will occupy any cavity. This nest was extracted chemical free from a bay window here in Moreland under a window seat. 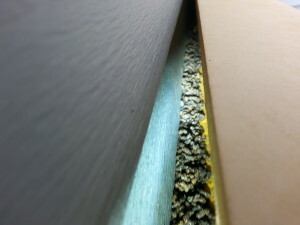 The yellow jackets found an entry point thru the vinyl siding and into the wall void. 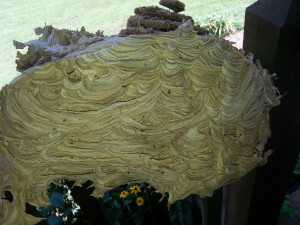 This is a good example of how Yellow Jackets comb are layered when built. If your having issues with any stinging insects remember we at Eco Wildlife Solutions, LLC remove all stinging insects chemical free. 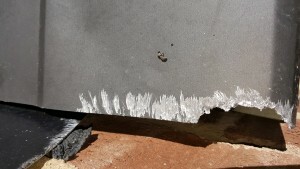 We can remove the target insect and all evidence of their homes from your structure. 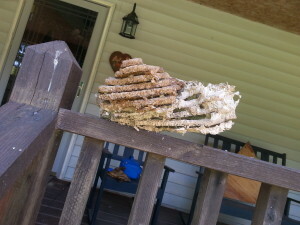 Brood Comb from a Yellow Jacket Nest.